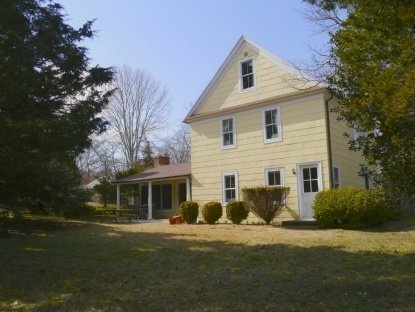 Rental Registration #: 17-401 This 1850's Farmhouse was recently renovated and is so charming! With 3 bedrooms (and bonus room) and 2 baths, one bedroom being a first floor master with brick wood burning fireplace, private entrance and a teak decked cover porch for relaxing. The open kitchen is large and open with white carerra marble counter tops and eat-in bar. Upstairs you'll find two bedrooms, and one bath with laundry closet. At the end of the second floor landing you'll find an additional staircase leading to a large third floor bonus room with original beamed ceilings. Just down the street is Amagansett's Main Street with wonderful shops and restaurants and the ocean is not much further! A great summer retreat!.